S.T.Dupont "Diamonds" is a Ligne 2 lighter from the 2010 Premium Collection. 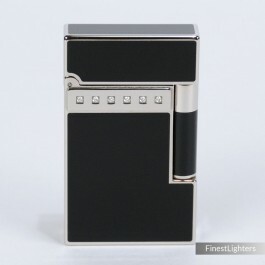 The lighter is set with 14 brilliant cut diamonds (0.35 carat) with quality G (extra white), VS2 (very small inclusions), and features a black Chinese lacquer finish with palladium (platinum) accents. A very elegant and ultra-exclusive lighter, completely sold out. Please note: the box is damaged (see the last two pictures).